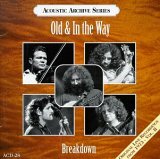 Breakdown is the second volume of the remastered concert performances of Old & in the Way by David Grisman's label Acoustic Disc. This short-lived group, which featured Vassar Clements on fiddle, Jerry Garcia on banjo, David Grisman on mandolin, John Kahn on acoustic bass, and Peter Rowan on guitar, quickly became a legend -- not only among Deadheads, but also along the bluegrass circuit. The tracks for this disc were taken from the same shows (at The Boarding House in San Francisco in October 1973) that also yielded the original 1975 Old & in the Way disc and the 1996 collection That High Lonesome Sound. The sound quality is superb, and the musicianship is truly amazing. Most notable about Breakdown are two Garcia-penned banjo jams titled Old & in the Way Breakdown and Jerry's Breakdown. Neither of these selections was released previously, and both feature some excellent interplay between Garcia and the other members of the band. As with the other outings by Old & in the Way, Vassar Clements steals the show with his incredible proficiency on fiddle. On Down where the River Bends, he underscores the song's melody with tear-stained sorrow, and on Goin' to the Races, he delivers a seemingly unlimited amount of unbridled, high-spirited energy. It's truly a shame that Old & in the Way existed for less than a year. All of the musicians clearly did this for the love of the music, and it really shows in their performances. There really isn't a weak point on Breakdown, and anyone who has enjoyed the group's previous efforts will find this set to be equally strong. Breakdown is available from Barnes & Noble.